As mentioned in Part 11 of Tales from the IPCPR, one key thing I look for in an Indie Cigar maker is to find a cigar that is going to standout and bring something different to the table. For those who follow the Indie Cigar market and have encountered Craig Cunningham’s Esteban Carreras line, they experienced this. Whether it is their 1961 Cameroon, Habano, or box press 10 Anos, I’ve found that many cigar enthusiasts have clearly walked away with a favorable experience. Therefore, I was excited to try the new 2010 Esteban Carreras 187 and 5150 sticks. Once again both sticks were completely satsifying. In this review, I focus on the Esteban Carreras 5150. Here are some facts on the Esteban Carreras 5150. For this review, I focus on the Torpedo. 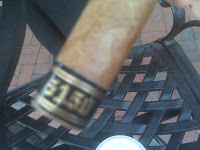 The cigar has a simple 5150 band with the Esteban Carreras logo on it. The Ecuadorian Sumatra wrapper gives this stick a very old school look. After lighting this cigar and getting the initial draw going, I immediately got a cream taste. A lot of times Nicaraguan tobaccos have a salty start, but not the case with this stick. As I approached about the 30% point of the burn, I got a nice kick of Cayenne pepper to complement the cream taste. No doubt, the pepper blast would be the dominant note here. As the burn continued, the cayenne pepper taste slowly subsided. As the pepper taste diminished, it would soon be replaced by a nice sweetness. Nut and coffee flavors made up a lot of this sweetness. As I reached the 80% point, much of the pepper was gone and the smoke was still sweet. The finish was not harsh and it still had the sweetness that had emerged earlier. Although the burn was good, I did get a little tunneling. I’m chalking this up to the fact that I was smoking this outdoors and there was a wind kicking up. The nub of the cigar was soft and warm. Again, I might chalk this up to being outdoors. Overall I would classify this as a medium strength and medium body. There was a wonderful complexity for this stick. Another interesting point is that the price point is in the $5.50 to $6.00 range – true value for this stick. This is a great everyday smoke and one to satisfy the novice or experienced cigar enthusiast. 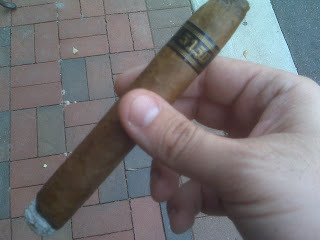 I smoked my first Esteban Carreras 5150 Toro today. I will also add I smoked it while driving in my car with the window AND sunroof open (I purposely did this to see how the ash of the stick did). Despite the amount of wind in the vehicle, not only did the burn NOT go out, but the ash got over one inch long before I flicked it off. I actually got the stick for free from Cigar Warehouse (in Gilbert, Arizona) along with various other sticks because I purchased a (very) nice humidor from there (BTW, Rick, the salesman there, was awesome because not only did he gave me so many free sticks, but he also knocked off $50 for the humidor as well). I agree completely with William Cooper regarding the creamy flavor and the cayenne pepper taste as well. After smoking THIS stick, I am heading back there tomorrow to purchase an entire box of them!